The University of Alicante Open Data Portal aims to take a step forward towards the future society where open data will play a key role in decision making. The reuse of the University open data adds value to various agents in society, enabling the university's further contact with its environment and thus, benefiting the community supporting it. Madrid will be the capital of the Open Data. The 4º Conference Internaciónal will celebrate the days 6 and 7 October 2016. The University of Alicante and the Office for New Information Technology organise the 2nd Open Data Meeting on 17 March. Book presentation "Ecosistema de Datos Abiertos de la Universidad de Alicante"
The book will be presented within the context of the University of Alicante 2nd Open Data Meeting. It describes the experience of the data opening process and the implementation of transparency policies. The University of Alicante and the Vice President for Information Technology have organised one more year the entrepreneurship awards based on applications to reuse open data. Manuel Alacaráz presented the Valencia Government Transparency Portal. This site will allow the public to consult the council agreements, their trips, costs, gifts and even recommend the end-use of economic resources. 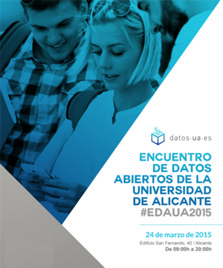 The University of Alicante Open Data Portal has been launched to consult all the UA information and data of interest. One more year, the SICARM-Derechotics conference will be held. This year's topic will be based on the reform of the Spanish legislation on open data as a supportive tool for enterpreneurs and the possibilities and challenges of the transposition in Spain of the European regulation on public information reuse. The awarded application in the 1st edition of the University of Alicante's Applications Competitions has been accredited and incorporated into the Repository of the Spanish Public Data Catalogue http://datos.gob.es. The prizes were handed out during the 1st Open Data of the University of Alicante, where 12 applications were proposed to reuse the University open data. The University of Alicante and its Office of the Vice President for Information Technology are organising the 1st Open Data Meeting for 28 April. All talks and presentations of apps in the 1st Applications Competition that will be held in the context of the 1st Open Data Meeting in 28 April, can be viewed here. The University of Alicante and its Office of the Vice President for Information technology have made a website available for developers with the aim of reusing and creating applications based on the University data. The University of Alicante and its Office of the Vice President for Information Technologies launches a new applications competition with significant prizes. Winners of the 1st App Idea Competition to reuse the University open data. Find here the winners of the idea competition.